Cat water fountains are viewed as a luxury by some pet owners. Others find it difficult to pick the right one for their pets. 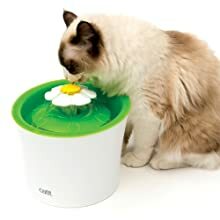 This review will highlight factors to help you pick out the best cat water fountain for your beloved pet. Before domestication, the feline ancestors were desert animals. This implies they were fully reliant on their prey’s water content to provide enough water. Since a majority of the prey of wild cats are small animals that have only about 70% water, and this was sufficient. On the other hand, domesticated cats eat what we give them, and this falls into two distinct categories: dry food and wet food. Wet cat food has a total water content of 80 percent, so the cats eating it just need two to four extra ounces of water daily. Cats that eat only dry food should have more water. Considering their ancestry; they are not the most diligent drinkers. Unlike dogs, cats have to be lured to drink water. First, the cat’s water bowl must be kept away from its food. Cats prefer fresh water as well and may think it is contaminated when it is placed where they eat. Also, because they like their water fresh, stale water is going to turn them off. Today, there are so many cat-focused water fountains available on the market.When it circulates the water, cat fountains aerate. This keeps the water fresh with a natural taste. By doing so, you can load up a water dish and leave it. These fountains also have filters to get rid of impurities that can appear from sitting out for a long period. The movement and sound of cat fountains mimic a running tap. This is something all cats love; it will encourage them to drink more water. 2 What Features Should You Look for in Cat Water Fountains? 4 Why Do You Need a Cat Water Fountain? 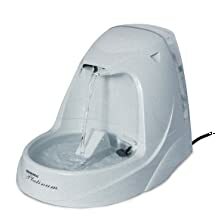 Picking a suitable pet water fountain is important for a pet owner. Cats may be quite picky about the kind of water bowls they drink from. Also, some cats are scared of the loud sounds that water fountains make. Typically, it takes some time for cats to get used to their fountains. Otherwise, lots of cats enjoy the sweet natural sound of flowing water. Pets will probably drink more water since the noise attracts them and the result of their drinking more water brings about a healthier and a happier pet. Do a thorough research on pet fountains to be sure about which one will fit your home. The come in a variety of sizes and shapes. Others are made with different materials. If you also want something stylish, you can look for attractive ones. What Features Should You Look for in Cat Water Fountains? Picking a cat fountain can be tricky since there are lots of them on the market. Considering some of these factors will ease your selection process. The ceramic or stainless steel fountains are believed to be better because they are not easily scratched like their plastic counterparts. The scratches can also harbor bacteria that can be harmful to the pet. Cats are prone to an illness called feline acne,and this results from touching bacteria that can hide in scratches on their plastic feed and water bowls. Cats can be easily startled so the best fountain for cats should have a very quiet pump that will not frighten your cat or discourage him from drinking. You also need to buy a model that’s easy to maintain. There’s no point buying something that should be taken apart all the time and cleaned with brushes. You want a fountain that can be washed with ease – and preferably dishwasher friendly. The fountain’s design and construction are quite important. This is because some pets have plastic allergies. 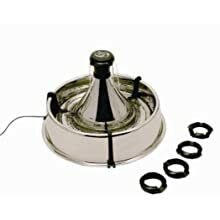 Ceramic or metal fountains area better choice for such pets that suffer from this allergy. Some fountains produce a fresh stream of water while others restock the water frequently. The capacity of a fountain is a vital consideration as well. After all, some cats drink more water than others, and some multi-pet homes should have more water. However, users must consider whether the large-capacity pet fountain would need to be emptied regularly for the water to remain fresh. Cat fountains, particularly those in homes with multiple pets, run tirelessly. They run continually and have a higher possibility of wear and tear. If you have several cats, you can opt for a fountain that can serve more than one pet. The continuous operation of the fountain to meet the demand of the cats can affect its durability. Cat drinking fountains also vary in price. The cost depends on materials, construction, and capacity. The ceramic fountains are bound to be more expensive because the product has more weight and is more durable. The Filter softens hard water. The pump may be a little loud. 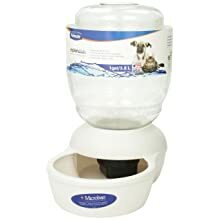 This fountain from PetSafe is made with ceramic material and may seem more expensive when compared to other plastic fountains. However, ceramic has some advantages when used in a drinking fountain. It’s tough material is not susceptible to tiny scratches,unlike plastic. This may allow bacteria to accumulate and that can cause acne. This material also helps to keep the fountain water cooler, and since it is heavier, it’s less likely to be pushed down. 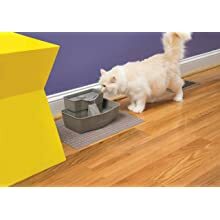 The fountain has a 2-liter capacity, and its elevated drinking dish may be ideal for arthritic or senior cats. They also have an option of sipping from the 2 free-flowing water streams or the big reservoir at the base. It has an elevated drinking dish for arthritic or senior pets. The Homdox Water Fountain is built with fountain replacement filters. 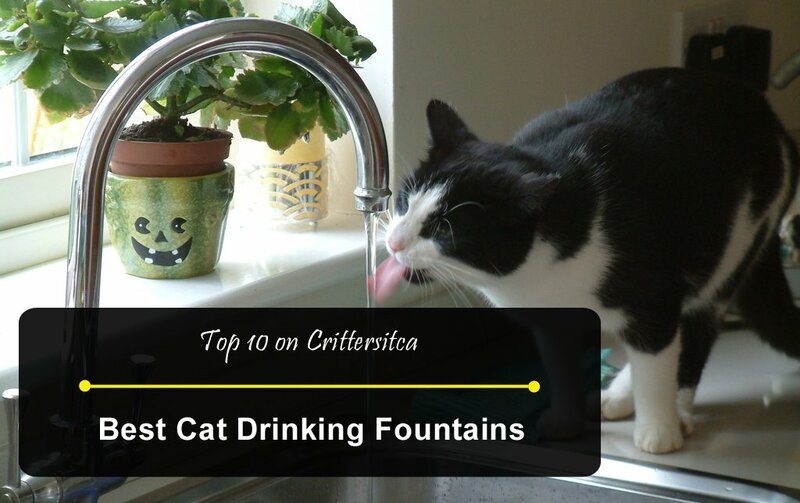 This may give it an advantage over other cat water drinking fountains. These filters protect the pet against water-related diseases. Users may be able to prevent injuries to their pet by ensuring that the water is set at the minimum level. It can be refilled with fresh water after the cat is done drinking. This fountain was designed with a multi-level structure that allows for one or more pets at a time. If you have space constraints, this may be ideal for your home. The fountain can be set up easily and also switches off automatically when the water levels fall below the minimum required level. 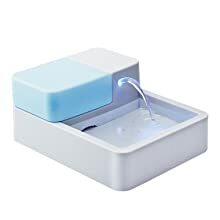 The LED lights may also attract the pet and keep them interested in taking water all through the day. Has led lights to attract the pet. Can serve one or more pets. The Drinkwell 360 fountain was built with replaceable charcoal activated filters. This feature helps remove bad odors and make the small and taste of the water better. It may be useful for homes with multiple cats. This fountain offers a full 360 degrees’ access to your cats. It can contain up to 128oz of filtered fresh water. It has a premium stainless steel texture that makes it fit in with the interior design of a house. It’s relatively easy to clean, making it more convenient to use. It comes with several changeable plastic spout heads which may make it ideal for multiple pet use. The water flow can be adjusted easily. The interchangeable spout heads make its ideal for multiple pets. The free falling water oxygenates the water and makes it healthier. The foam filter removes debris and hair. This Platinum Pet Fountain may help keep your cat hydrated and healthy by making them take more water. Pet owners can also use this fountain for dogs as well. Its modern design gives the fountain a free-falling watercourse of oxygen-aerated water,and this is vital for a healthy cat. This product was built with a free falling system. This system makes the water fresh by generating oxygen-aerated water. The water’s taste may also get better with its carbon activated filter. It also has a submersible pump that makes it works noiselessly. Furthermore, it has a low voltage operation that may make it safe for pet use. It also has a capacity of 168oz and simple features that may make it user-friendly. It comes with an adjustable water flow. Its motor hardly makes noise. Has a replaceable charcoal filter. Has a built-inreservoir, and this means you won’t have to continue refilling. It isn’t suitable for use outdoors. The PetMateReplendish Waterer has some good features, and one is the extra-large capacity. The fountain can hold up to four gallons of water at a time. This kind of water dispenser comes in several colors like pearl blue, brushed nickel, pearl white as well as peacock blue. Pet owners who may want to keep larger amounts of water in the dispenser can try this option. Also, there are so many colors to select from, and the bottle design is quite easy to clean. 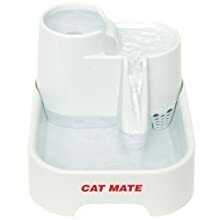 The fountain may be ideal for pet owners who travel often and do not have a lot of time to clean up their cat water dispenser regularly. Made with BPA-free PET plastic. Safe for both cats and canines. Uses a modern water filtration system which reduces chlorine and chemicals. Has Microban Antimicrobial Protection that prevents stain and odor-causing bacteria. It has a wide mouth for easy cleaning. It is slippery and heavy during refilling or transportation. The Petsafe water station can provide clean drinking water for a cat all the time. The design holds a gallon of water and reduces the need for a refill. Its stainless steel bowl is removable and may make it easy to clean. The fountain as built with a flow control valve and this feature prevents spills. It’s built with durable plastic,and this may make it more durable. Pet owners can also use the water station for dogs as well. They come in three different sizes depending on the need of the pet. This fountain may be classified among the classic water fountains that are quite popular. This plastic Fountain has three drinking areas placed at different heights. 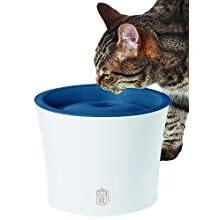 This helps the cat to choose where to drink from. It has a bubbling outlet found at the top, a flowing water stream in the middle and a wide bowl located at the base. The cat fountain has a large capacity of 2 liters, and it is average for a fountain. It may provide lots of fresh water and won’t take up too much space. Adjusting the water flow is difficult. This Multi-Tier pet fountain is designed with a free-falling stream and cats tend to prefer this type. The water circulates well and goes through charcoal filters. There is a larger water capacity option that has multiple levels. This fountain may be a great option for several cats at once. It has a 100 oz. Water Capacity. A raised top bowl which is ideal for older or disabled cats. A little difficult to clean. This fountain from Hagen may be suitable for both small dogs and cats. It has a large surface area that allows the water to absorb more oxygen. This may result in fresher, and better-tasting water for a pet. The fountain’s body is built with plastic and is safe for the dishwasher for easy cleaning. It has a dual function filter as well, and it absorbs all water impurities like food, debris, and hair. The fountain also softens hard water as it removes excess magnesium and calcium. This may help the cat to maintain a healthy urinary tract. Why Do You Need a Cat Water Fountain? Having a cat water fountain isn’t a luxury as some may think, it is a necessity. For pet owners who are concerned about their cat’s health, a fountain is a necessity. A pet fountain offers a pet the benefit of drinking clean water all through the day. Pet owners always want to give them nothing but the best quality of food. So why can’t same be done for drinking water? A pet fountain helps keep the pet healthy by giving them high-quality drinking water even when the homeowner isn’t at home. All pet owners can tell that their pets are fascinated with dripping faucets. One reason behind this is the innate nature of these creatures. They prefer running or fresh water sources over the stagnant ones. Fountains have a similar running water supply that may just convince the pet to use it. Fountains also have a built-in filtering system and this feature is ideal for busy pet owners.In some models, fountains have large reservoirs that can supply fresh water to the pet for a couple of days for those going on short vacations. Most fountains have a tiny submersible tank which circulates the drinking water from a bowl to the tank. During the filtration process, it goes through a charcoal filter which ensures that all impurities have are removed. These fountains certainly help with convenience. 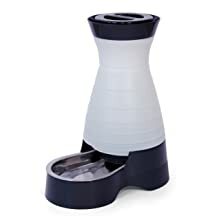 You will not have to change the water every day because it has a water filter and some models have big reservoirs to give your pets a larger water supply. Use household supplies like vinegar, salt, lemon juice or baking soda. You’ll also need a mesh scrubber and a bristled cleaning brush. If necessary, you can disassemble the product with the manual and start the cleaning. Hard water spots can be removed from plastic fountains with some salt. Moisten the plastic mesh and scrub it with the salt so that it forms a paste. Rubbing the paste into the dirt deposits will loosen it up easily. 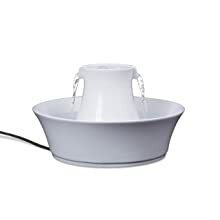 Ceramic fountains can be cleaned with distilled white vinegar. Apply this substance to the ceramic bowl and let it soak for about ten minutes to loosen the deposits. It’ll bubble and fizz during this process. You also shouldn’t use a non-scratching mesh to get rid of stubborn deposits. Stainless steel fountains can be washed with vinegar or lemon juice. Spraying these mixtures on the stained spot and cleaning with a mesh scrubber will remove stains. When it comes to picking the best cat fountain, you need to consider its durability, its purpose, its design. Also, consider how easy it is to clean and use. The material used in making it may affect its purpose in the case of allergic cats. In all, the cat’s preference must be put into consideration. Do you have a nervous cat? Do you have multiple cats? Consider the noise level of the fountain as well as the durability. The Catit Flower Fountain has great design with and inbuilt reservoir. It may be ideal for busy pet owners who don’t have time to refill often.